Since 1936, the National Wildlife Federation has worked to conserve the nation’s wildlife and wild places. As part of our 80th anniversary celebration, we are recognizing important moments in our history that continue to make an impact today. 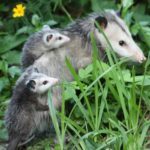 Summer is a great time to kick off camping season in many areas of the country, and one of the biggest draws of venturing into the great outdoors is the opportunity to see wildlife. To help prepare for camping around wildlife, our naturalist and television host, David Mizejewski, has prepared tips to keep yourself – and the wildlife – safe. David recently celebrated his 17th anniversary with the National Wildlife Federation, and we’re pleased to celebrate this milestone with some of his best advice for sharing the outdoors with local wildlife. Read up on the wildlife species present in the area in which you’re planning on camping. This will provide you with a great checklist for your trip of species you might see. It will also make you more aware of potentially dangerous species, such as venomous snakes, or large carnivores, such as bears, alligators or mountain lions. Remember that when you camp, you’re camping in wildlife habitat. Never approach wildlife. Any wild animal will bite, kick or scratch to defend itself if it feels threatened. Resist the urge to take a selfie next to a wild animal. Observe and take photos from a distance and always follow the posted guidelines for the distances that must legally be kept from wildlife. Remember, herbivores and small wildlife can be just as dangerous as carnivores if approached and threatened. Do not feed wildlife. Feeding wildlife is dangerous and can be unhealthy for the animal. It also teaches wildlife to associate people with food and lose their natural fear of us. This, in turn, causes situations where wild animals approach people looking for food, which then usually ends up with the animal being euthanized. Store your food and trash properly. Even if you don’t feed wildlife directly, you could still attract them and inadvertently feed them if you don’t keep your food and trash in wildlife-proof containers and/or away from your campsite. Make sure to take any trash out with you to keep the wildlife habitat clean. Don’t catch wildlife for pets. Wildlife such as frogs or turtles seem like they can make good pets, but they aren’t. Not only is taking wildlife from natural areas potentially illegal, it’s also unethical. Animals taken from the wild and put into cages generally languish and die without professional care. Let wildlife be wild and enjoy it in its natural habitat. Keep your dogs on a leash, or leave them home. If allowed to roam freely, pet dogs can become prey for mountain lions, wolves or coyotes, or get bitten by venomous snakes. They themselves can also kill smaller wildlife species. Pack the right gear. You should wear snake boots if venomous snakes are common where you’re camping. Also, you should apply insect repellent to avoid being bitten by ticks, chiggers or mosquitoes. If you camp with a pet, make sure that pet’s heartworm and tick medicine are up-to-date. Remember to carry pepper spray in bear country. Also bring binoculars, field guide books or apps, and a notebook and pencil to record your wildlife observations or make sketches. Learn more from David Mizejewski about wildlife gardening, native plants, and more, and follow him on Facebook and Twitter. Also stay tuned for his NatGeo WILD series Pet Talk and appearances on Conan, Today Show, Wendy Williams, and others. Find out where you can see David next. Pledge to CampTake our naturalist’s advice and get outdoors to camp this summer!